Ilka is and hardy easy to grow clematis breed by Uno Kivistik in Estonia. It has large flowers with slight ruffling around the edges. Flowers over most of the summer. I find it better to hard prune it in the early spring. 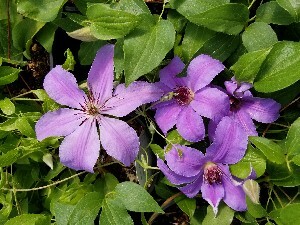 I am thrilled to be able to offer this wonderful clematis to you again. Large White flowers that have a gray-blue cast. Deeper blue edging with deep red anthers. This is a very stunning clematis than blooms it's head off for me here in Washington. Easy to grow.